Our overall aim is to develop novel treatments to enhance the body's immune defenses against cancer. Our research aims first at uncovering new mechanisms leading to activation of the immune system, for example during viral infections. Using this bioinspiration, our goal is to develop pharmacological ways to stimulate anticancer immunity. What is the early sequence of immune activation during a viral infection? How can we reproduce this sequence pharmacologically? How do virally-derived components, such as Toll-like receptor ligands, activate anti-cancer immunity and decrease cancer-associated immunosuppression? Can we enhance migration of effector T cells into the tumor with virally-derived components? Can we use nanoparticles as delivery system to focus their action and prevent unwanted side effects? Congratulations to Sandra HOCEVAR ! 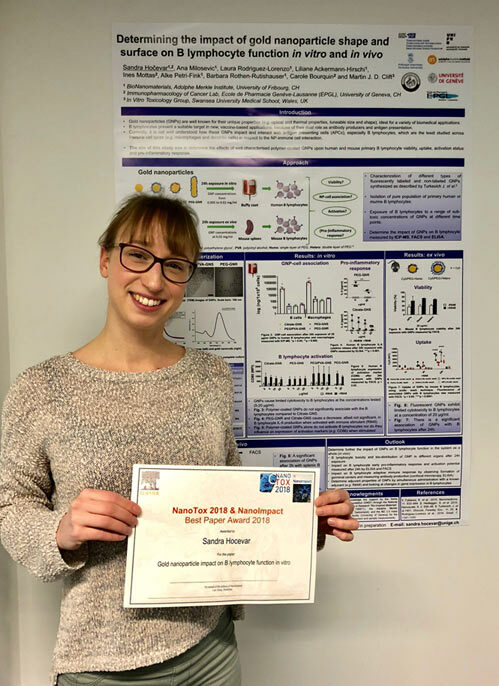 Her poster “Determining the impact of gold nanoparticle shape and surface on B lymphocyte function” presented at the 2018 NanoTox International Conference in Neuss (Germany), was awarded the Best Poster Prize (500 Euro offered by the NanoImpact Journal).